Stuff happens in life that we have no control over. Sometimes we default to running away from our issues, hiding our less-than-pleasant truths, and building emotional walls to keep people from finding out about our hurts. This may be a default for many of us, but it’s not healthy or productive. We end up emotionally stunted by our past pains and failures. The trouble with this is that, at some stage, your past catches up with you; and then the healing process is exceedingly more difficult! 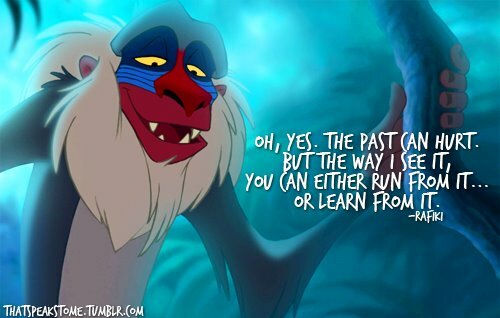 The other option is to learn from your past hurts. Figure out why it hurt so much. Did it trigger some insecurity you may have? Be honest with yourself, name your weaknesses and fears, and then get some help to improve them. What could you have done differently? How else could you have reacted? Think of someone you admire – what would they have done? Think about it, make a note of it and remember if for the future. Life will never be free of failure and hurt. It’s something that affects every one of us. The only thing we can control is how we react and learn from our experiences. It’s important for parents to teach this lesson to their children sooner than later. Being open and honest with your kids will help your kids live a full life with no regrets! What are some of the greatest lessons you have learnt from your past?